This map illustrates satellite-detected areas of flood affected land as detected in satellite imagery acquired by the TerraSAR-X satellite on 09 August 2014 in Khartoum State, Sudan. The area surrounding Khartoum City and Umdurman was inundated by floods caused by heavy rains. Areas to the South of Umdurman seem to have been flooded and many other areas including Umdaba and East Nile seem to be affected by varying levels of water and saturated soils. 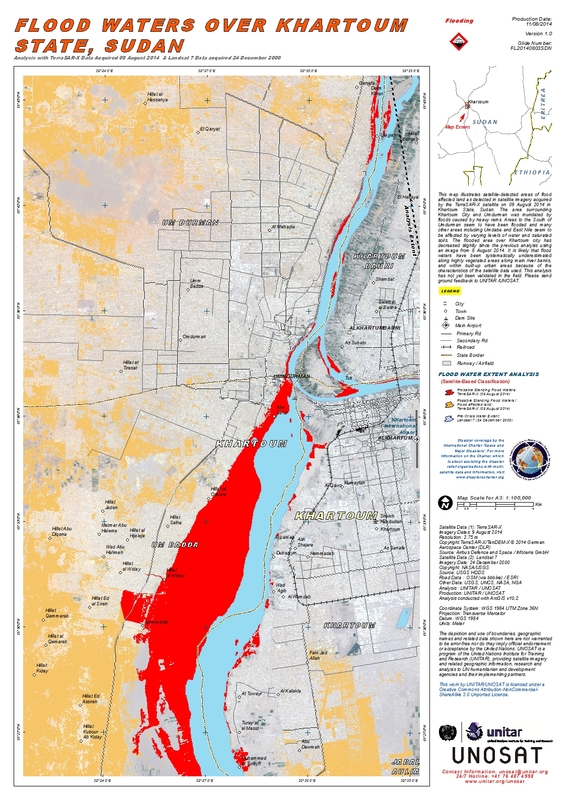 The flooded area over Khartoum city has decreased slightly since the previous analysis using an image from 8 August 2014. It is likely that flood waters have been systematically underestimated along highly vegetated areas along main river banks, and within built-up urban areas because of the characteristics of the satellite data used. This analysis has not yet been validated in the field. Please send ground feedback to UNITAR /UNOSAT.